The accrual basis of accounting is important to produce accurate financial statements and reflect financial position of the company. It’s a principle of accounting which records expenses or revenues when they are consumed or earned and not when they are paid or received in cash. GAAP (Generally Accepted Accounting Principles) allows only the accrual concept in preparing financial statements as this will result in accurate or correct reporting of income, liabilities, assets and retained earnings. It will in turn help in better understanding of the financial position of the company. 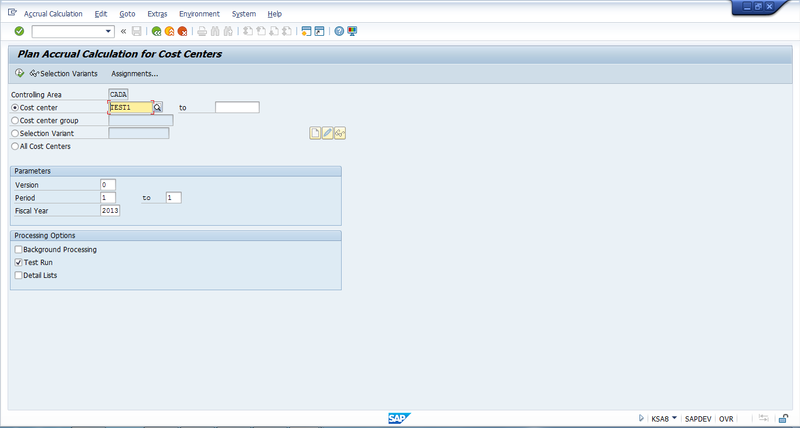 In SAP ERP, allocation of operational expenses is different in financial accounting (FI) and in management accounting (CO). For example, prepaid rent for a year is recorded in external accounting (that is FI) as a current asset but in management accounting (CO) it has to be recorded as a cost proportionally divided to monthly intervals. This will result in accurate internal reporting and accounting, and is known as accrued costs. The evenly distributed cost is known as time-based accrual calculation. Posting of accruals in financial accounting (FI) by the use of recurring entries and moving the entries to the controlling module by the use of a cost element for accruals. The imputed cost or the accrued cost are calculated in FI and not in CO.
Secondly, the cost can be accrued by an accrual calculation approach in the CO module. The percentage method involves usage of a percentage rate to determine the cost to be accrued in the accrual calculation. The benefit of using this method over the recurring entry method in financial accounting (FI) is that it is based on when the cost is actually posted. This method is normally used in non-wage labor cost (e.g., for vacation bonuses). The user plans a 10% rate on labor cost for the vacation bonus and the labor cost per month is $10000, so the planned cost for vacation bonus will be $1000 per month. The amount accrued in cost accounting equals to $1000 / month = $12000 / year, the credit is posted to an order every month (in CO). The expenses are posted in financial accounting in the month of June for the whole year. Target=Actual method is normally used in activity dependent costs. The planning is done on an accrual cost element. Company expects the utility cost of $36000 in period 11 on the cost center 4520 (production). You should plan accruals for activities on the production cost center and the system will distribute them equally using the standard distribution key 1. The actual production hours are 1200 and the planned hours were 1000. This results in the rate of 1200/1000= 120%. The expense will be posted in financial accounting in the period 11 and the corresponding cost will be posted period-wise in CO. The difference of $7200 = $43200 – $36000 will be transferred to the operating profit. Plan=Actual method is used for activity-independent cost. Target cost is not determined and the planned cost is used in the actual cost. Let’s imagine that we need to pay a certain insurance premium. The insurance premium is equally distributed using the distribution key 1 (equal distribution) which will distribute the cost equally between all the periods when we need the insurance. So, if the insurance premium is $1000 / month, it will be reflected like this in SAP CO. Whereas a posting of $12000 will be made in the period 11 in SAP FI module because the premium is paid once per year (12 months). 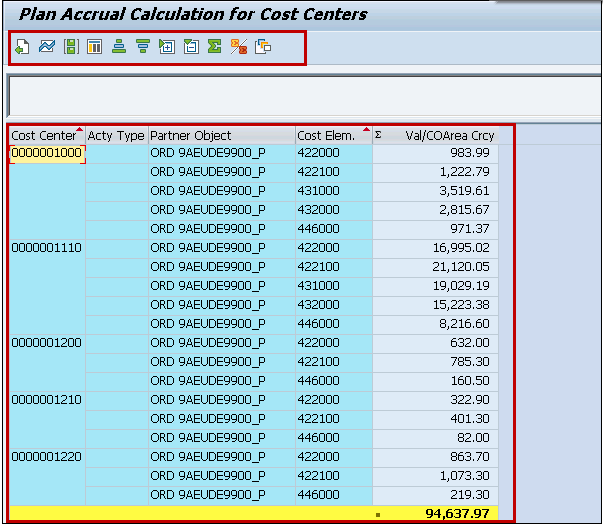 Let’s briefly see the steps for calculation of accrual for cost centers. Alternatively, you can directly start the transaction KSA8 from the command bar. 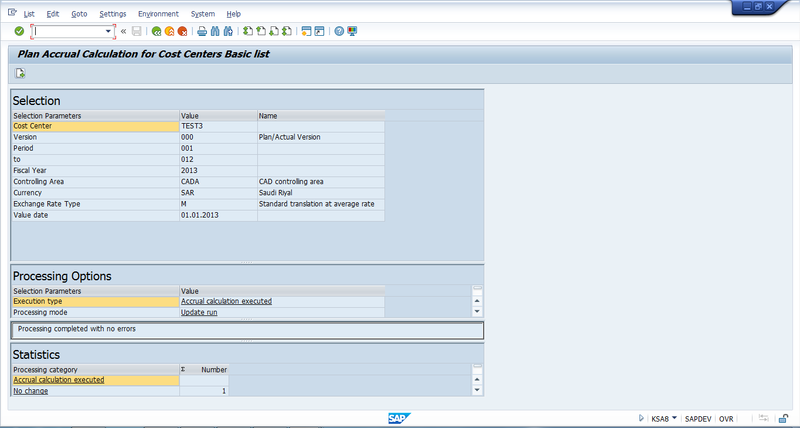 Enter the cost center or a group of cost centers for which you want the accruals to be calculated. Version 0 is used for plan/actual method. It is recommended to choose the Test Run option first and execute the transaction to see simulated accrual calculation. If everything is correct, then select Background Processing and execute the transaction in the normal mode. On the next screen verify the displayed information and click on the arrow button . You will see the posted accruals amounts.